Create and maintain a dynamic organization that meets its objectives to the satisfaction of those being served and with a high degree of morale and sense of achievement on the part of those rendering the services. To reduce morbidity and mortality rates due to injuries and environmentally related diseases. Conduct seat belt and car seat surveys with intervention educaion. 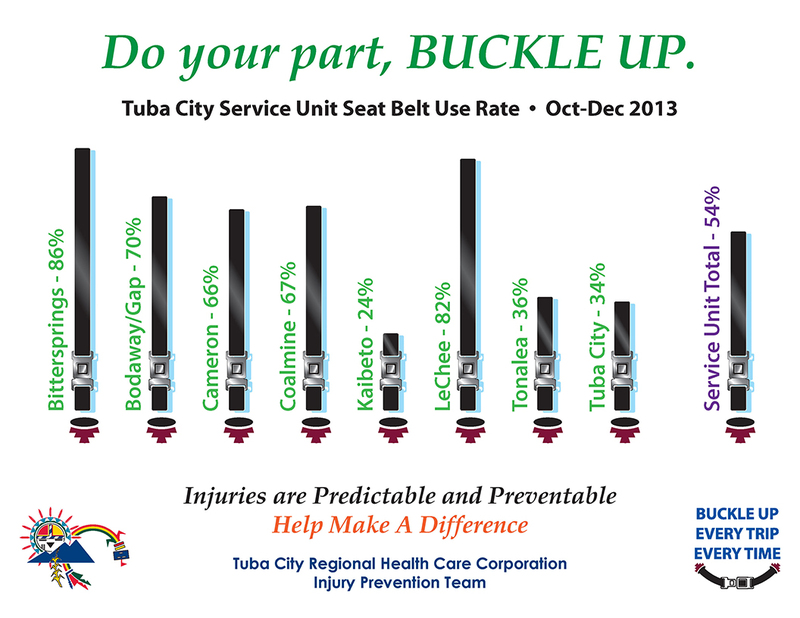 Develop and provide seat belt and car seat use surveys to the public at health fairs, Chapters, schools, and Law Enforcement Agencies to encourage seat belt and car seat use, and enforcement of existing Tribal and State laws. 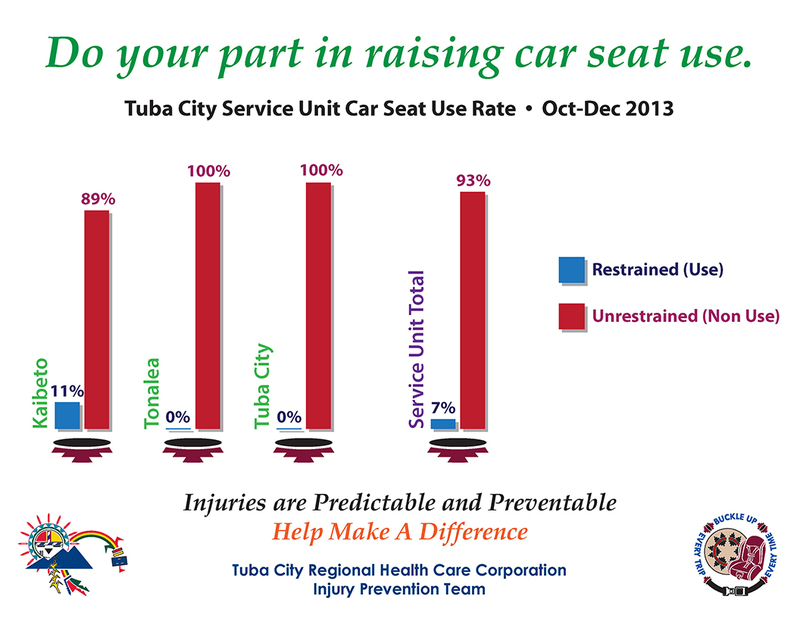 Provide seat belt and car seat education to local schools and head start students, staff, and parents. Distribute car seats at a low cost. Assist communities interested in submitting Injury Prevention Grant Proposals. Provide educational presentations to local leaders, Chapter Officials and Health Board members. Identify high-risk population and factors contributing to injuries through active injury surveillance. Plan and implement community injury prevention activities. Provide information and technical assistance to communities on injury prevention. Provide financial assistance to approved IPC projects. Survey institutional food service establishments. Train institutional food service workers. Investigate reported food borne illnesses. Conduct plan review and site evaluations for proposed new food services (e.g. restaurants, cafes, etc.). Survey public water and wastewater systems. Provide technical assistance in operating temporary water and wastewater systems. Investigate water quality and wastewater complaints. Provide technical assistance on solid waste issues. Conduct plan reviews and site evaluations prior to construction of new facilities. Conduct comprehensive environmental health and safety surveys of Tribal institutions (e.g. schools, head start programs, day cares, nursing homes, residential care facilities, detention centers, etc.). Provide environmental assessments upon referral or special request for public buildings. Investigate communicable disease outbreaks (e.g. plague, Hantavirus, enteric illnesses, etc.). Provide technical assistance on insect and rodent control. Conduct, upon request, informational presentations on environmental health issues. Participate in Chapter and organizational health fairs. © 2017 Tuba City Regional Heath Care Corporation. All content on this site is copyrighted by Tuba City Regional Heath Care Corporation.